No one wants to spot a cockroach scurrying across their floor. 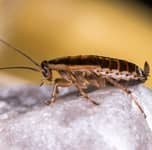 Particularly alarming for restaurant owners, cockroaches carry diseases like E-coli and salmonella. These black shelled insects produce more than 300 eggs in their short life span; thus, they breed very quickly. In fact, if you see one cockroach, there are tons more you cannot see. Once they begin to reproduce, it's impossible to control the breeding without professional help. Cockroaches are nocturnal creatures that seek shelter in your home or business for food and water. Infestations spiral out of control quite quickly - even before you realize they are there. There are many species of cockroaches specific to Tennessee, such as the American, brown banded, Oriental and German cockroaches. Here at PureGuard, we have the tools to handle your infestation quickly and effectively. Don't allow cockroaches to set up shop in your home or business, which could lead to devastating effects on the health of occupants. Remember, these unwanted guests are known for spreading diseases like salmonella and E.coli, putting the safety and health of your family, employees and customers at risk. Call PureGuard today at 615-502-2855 for a cockroach removal consultation. Awesome customer service and did a great job. Very professional company and you can tell they are run well. No more Cockroachs! I will definitely use them again.